Pilli Adventure » Archive » Giant Paco Adventures part 2. Giant Paco Adventures part 2. This entry was posted on Wednesday, November 9th, 2011 at 1:53 am and is filed under Uncategorized. You can follow any responses to this entry through the RSS 2.0 feed. You can leave a response, or trackback from your own site. 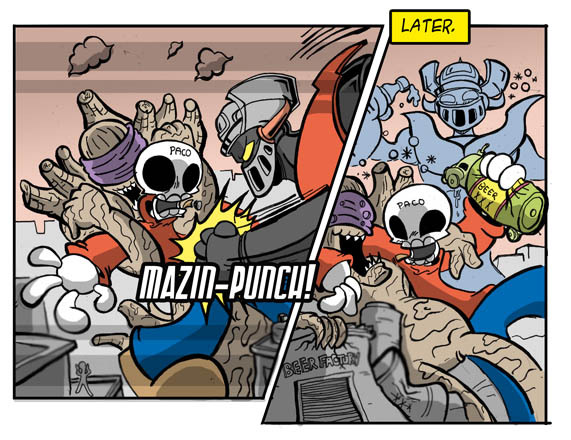 I recognize Mazinger. ^.^ But I’m pretty heavily into anime/manga, so yeah. It’s true! By the time I get around to referencing something it’s usually pretty old.. Hee.. classic mazinger. Or you are as old as I am… but wouldn’t you have asked, I would not have even considered… I loved it when I was a kid but now it seems so horribly boring and topical! I dont know really I just watched the re runs when I was a kid, but like a year ago with the mazinger revival series Mazinkaiser I read all the original manga and it was awesome.